In 1998, healing Merville residents Peggy Carswell and her husband, symptoms Kel Kelly, took a leave of absence from their jobs and went on a 10-week adventure to India. For most people, the story would end there. For Carswell and Kelly, however, this trip would be a turning point in their lives and in the lives of thousands of others—both here on Vancouver Island and in India. Carswell had been captivated by India. The idea of sourcing organic tea and helping small farmers in remote villages appealed to both her sense of adventure and her heart of compassion. She began extensive research on Indian culture, tea production, organic farming, small grower cooperatives and much more. Before long, she was armed with information and on a plane back to India. Her goal was to meet with small scale tea growers in Assam and to help World Community expand their fair trade business to include tea. Little did she know that, along with her husband, she would spend the next 10 years teaching interested growers how to grow tea organically, set up a cooperative, establish an export and distribution network to enable the Assamese to increase their profits and better support their families, and establish a resource centre in Assam to promote organic farming practices. She explains that, prior to her 1998 visit, Assam had been under political siege for decades and few Westerners had ever traveled there. On her first visit, whenever she and Kel came upon a new village, they had to be interviewed at the local police station and were assigned armed security guards to protect them from insurgents. Today, the situation has improved, but travel through many parts of northeast India can still be risky. Assam is both the name of a state in northeastern India and the name of the distinctive black tea that grows there. Assam has a humid, sub-tropical climate and produces about 15 per cent of the world’s tea. It ranks number two in the world of tea production, second only to Southern China. Assam is also one of only two places in the world where tea is a native plant. The tea grown here is often sold as English, Irish or Scottish “Breakfast Teas.” It is said that in the 19th century, tea exported from Assam revolutionized tea-drinking habits globally, since the tea plant yielded a distinct flavor. Carswell explains that large non-Assamese business interests control the bulk of tea produced in India. Relying on a workforce originally brought in from other parts of India, it has historically offered little benefit to the people of Assam. In the early 1990s, a number of Assamese families began planting and cultivating tea in an effort to improve their lives. Most of the tea they harvested was sold to “bought leaf factories”—often at prices that barely covered production costs. Without access to small scale processing equipment, technical and educational support, or a market for their teas (without the middle man), many of these families were (and still are) struggling to survive. Early in her quest, Carswell had aligned herself with the All-Assam Small Tea Growers Association and had been assured that, when she met with its members, they would be able to understand English. Minutes into her first presentation, she realized that communication was a problem. She could tell by the puzzled—yet enthusiastic—looks on their faces that they had absolutely no idea what she was saying. On that second trip back, and subsequent annual visits over the next 10 years, Carswell learned that the Assamese people had been led to believe that chemicals were “the future of farming.” Many had lost faith in the efficacy of farming practices traditionally passed down for generations. Bags of chemical fertilizers had replaced cow manure, harsh chemicals controlled insect pests and crop rotation had become a thing of the past. New hybrid seed varieties, which required constant irrigation and where ultimately much more susceptible to insect damage and disease, were introduced, and many important varieties of rice and vegetables were being lost. With the encouragement of a number of organic growers here on Vancouver Island, and using information on organic farming in the sub-tropics published by organizations based in India and Britain, Carswell was able to develop training materials suited to Assam’s climate. The skills and knowledge of many farmers from the Comox Valley have played a vital part in improving the Assamese farmers awareness of composting, insect pest management and crop rotation. After four more years and a number of two- and three-month long trips to India, Carswell was growing weary of traveling throughout the state. A central teaching and resource centre needed to be established. Not only would this be less taxing, it would also create much-needed employment opportunities in Assam. She and Kelly had still not been able to import any organic tea produced by their small group of growers and they were pretty much still funding this effort on their own. In the fall of 2003, Carswell and a team of enthusiastic Comox Valley volunteers registered Fertile Ground: East/West Sustainability Network. The association received charitable status in 2004. With the support of a hard-working board of directors and volunteers, came an opportunity to do some serious fundraising. Start-up funding was secured from Vancouver-based Canada-India Village Aid Society (CIVA) to assess the needs of farmers and organizations working in rural Assam, develop additional resources materials and then provide training to farmers and other groups. Support from CIVA also made it possible to start the “Growing Healthy Families Program”—providing women of Assam with information, training and opportunities that encourage healthy, local food production; and helping them find ways to diversify and increase family incomes. Two years later, Carswell and Kelly met with members of a Rotary Club in Assam and discovered they were interested in working together to establish a project to promote organic farming practices. The following year, the two groups were entrusted with an abandoned plot of land in Digboi that was owned by Indian Oil Company, on which a demonstration garden and a classroom would be built. In the spring of 2007, Fertile Ground and the Rotary Club of Digboi opened the Adarsh Seuj Prakalpa Organic Demonstration Garden and Training Centre. It is located 540-kilometres east of the state capital, near the India/Burma border. The Centre now boasts a resource building, demonstration gardens, and a small retail outlet that sells organic produce and compost, as well as two small scale production units where vermi-compost and various botanical formulas are made. The Centre has become a place where Assamese men and women come to learn, children come to play and all help tend the garden and share its harvest. It is a place of learning and a place of joy. It is regularly visited by farmers, small tea growers, educators, agricultural extension staff and students, and has attracted guests from Canada, Australia, Nigeria, Germany and the United States. In addition to training people from the Digboi region, staff from the Centre also take their lessons on the road. A portable electricity generator—a rarity is Assam—audio-visual equipment and resource materials translated into the Assamese language allow them to visit and teach in remote villages, too. Today, the Centre has four full-time and several part-time employees. It is managed by a capable young Indian woman named Pompy Ghosh, who spent her first year as a volunteer at the project. Most humbling, however, is their answer to my final question: Is there anything else they would like the people in Canada to know? These responses make it easy to see why Carswell and Kelly are so passionate about this project. This winter, for the first time in 10 years, Carswell will try not to go to India. “My ultimate goal was that this project would eventually be taken over by the Assamese people,” Carswell says. “The Centre is being well-managed and I keep in touch with Pompy and others via email. “Several of the growers we have been working with over the years are growing, processing and exporting their tea. Kel and I now have six varieties of organic fair trade tea available for sale here through our newly formed business, The Small Tea Co-operative. Proceeds from the sale directly support the tea growers. While our work is by no means complete, I think we can say that our efforts have been pretty successful. I will spend my volunteer time this winter working from Vancouver Island. I am hoping to find two or three new people who are interested in Fertile Ground and who would be willing to become board members. Together, we will do our best to support Pompy and her team from a distance. Fertile Ground has planned a fun-filled fund-raising event for 2:00 pm, Sunday, November 1st at the Florence Filberg Centre. The Mad Hatters Tea Party will feature a selection of decadent desserts, fruit and several different teas, including flavorful Indian “Chai” prepared with fresh ginger and spices. Local herbalist and owner of Innisfree Farms, Chanchal Cabera, has promised to make up a special Mad Hatters blend for all to sample and enjoy. There will be prizes for the most unusual hats, a silent auction and much more. A highlight of the evening will be a slide presentation, showcasing Assamese culture and, of course, the Adarsh Seuj Prakalpa Resource Centre. Money raised will enable Fertile Ground to continue to maintain the Centre and provide information and training to interested farmers, self-help groups and tea growers in other parts of the Assam. Tickets are $16 each and are available in advance at: Home and Garden Gate (Courtenay and Cumberland), Bop City Records (Courtenay), Blue Heron Books (Comox) and Abraxas Books (Denman Island). 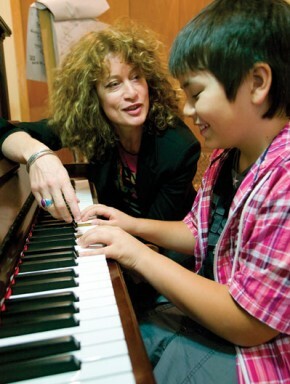 piano instructor Kelly Thomas is musical. As she talks about how music has shaped and guided her life, online her silver bracelets quietly chime together. And as she excitedly discusses the power of music and the inspiration she finds in sharing her musical passions with her students, her wrist symphony rises to a crescendo.